There are new silver dollar coins available from the United States Mint in 2019 to mark the 100th anniversary of the founding of the American Legion. Founded by American service members during the aftermath of World War I, the legion organizes community events to honor veterans, is involved in children and youth activities in local communities, and lobbies on behalf of veterans, service members, and their families. 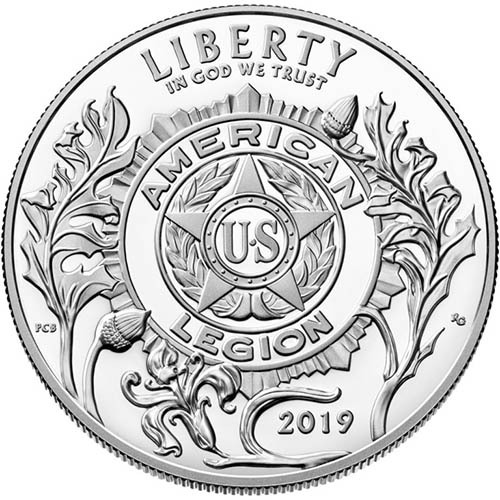 The 2019-P $1 Proof Silver American Legion 100th Anniversary Coin is currently available to you for purchase online at Silver.com. Coins ship to you inside of protective capsules and come with US Mint presentation boxes with a Certificate of Authenticity included! Issued by the US Mint to mark the American Legion’s 100th Anniversary! Mintage limited to 400,000 coins only across the silver product lineup! Consists of 8.539 Grams, or .2745 Troy ounces, of .999 fine silver. The obverse features the American Legion’s emblem. On the reverse are the flags of the United States and American Legion. In the American Legion 100th Anniversary Collection, the US Mint offers bullion uncirculated coins, proof coins, and silver-clad half-dollar coins. The silver bullion coins have a $1 (USD) face value and come in uncirculated or proof options. The proof coins have frosted design elements with mirrored background fields. The American Legion was actually founded in Paris, France. US soldiers were stationed across Europe following the end of World War I to provide stability to the embattled victory nations. Members of the American Expeditionary Forces in Paris, France, founded the American Legion at the American Club near Place de la Concorde on March 15, 1919. 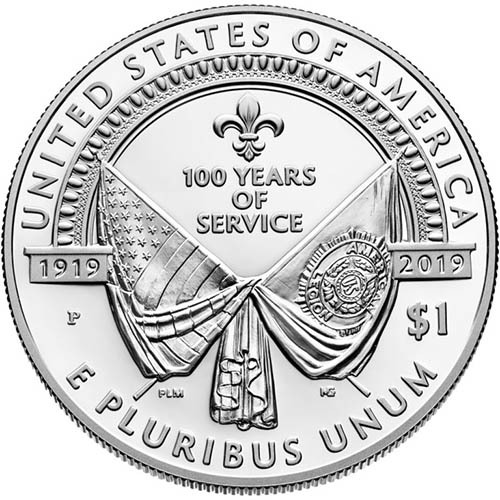 On the obverse side of 2019-P $1 Proof Silver American Legion 100th Anniversary Coins is the design of the American Legion emblem. The emblem features a geometric design around the outer edge, a circular rim with the words “American Legion” inscribed, and a five-pointed star in the center with “US” inscribed on it. These 2019-P $1 Proof Silver American Legion 100th Anniversary Coins are available to you with a protective capsule, US Mint velvet-lined presentation box, and a Certificate of Authenticity from the US Mint. The United States Mint issues the silver bullion coins in this collection with “P” mint marks from the Philadelphia Mint. The silver bullion coins share a design, while the silver-clad half-dollar coins and gold bullion coins each have their own unique designs.